June 2012 ... "We had a great time. Living arrangements were perfect and the bedding more than adequate. Personnel always friendly and willing to help with a smile. I will definitely recommend Jikeleza Lodge to my friends and family. Should the need arise to visit PE again, I myself will first check with Jikeleza Lodge." May 2005 ... “ I just expected to stay for a couple of days. I really found great friends and the more interesting things that make the time here, a lifetime stay. Was exactly what I was looking for, something special and different.” Frank, BARCELONA. November 2004 …”Had a lovely relaxing stay, loved watching the dassies in the back garden, thank you” Suzie IRELAND. May 2004 …”Nice friendly place ! Thanks for a fun stay!” HANNA, BRITTA AND ERIN. 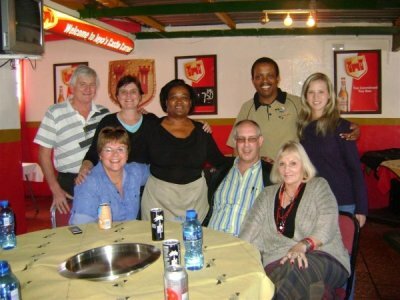 March 2004 …”We came here tired and found a really familiar place which we enjoyed it’s nice and friendly atmosphere. Thank you for this – we would like to come back sometimes. “ Martin and Burger. October 2003 …”Thank you for providing such a clean and friendly hostel. The Addo trip was amazing and we would recommend Jikeleza to fellow travelers and friends. On to Jeffreys Bay now, Bye.” Georgina and James, ENGLAND. January 2003 …”Thanks for recommending Schotia Safari’s, seeing the lions in the sunset was fantastic. Many thanks to the owners of Jileleza Lodge who made our stay very comfortable. “Jolica & Scharton, Heidelberg, GER. December 2001 ... "Thank you for organising the day trips and making us feel so welcome." August 98…. "I CAN’T LEAVE THIS PLACE!! The people are just too addicting.” Sonja Wedge, U.S.A.
December 97…"Thank you for all the help you gave us all in sorting out our lives. This is the best place to get everything arranged. You guys know what you are doing"